Guests this week on TEN’s new morning shows Wake Up and Studio 10 include Spiderbait, Kate Miller-Heidke, Charles Firth and Ray Martin. 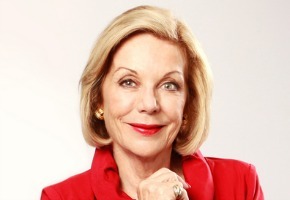 If she wasn’t already one of Australia’s most stylish television personalities, Ita Buttrose is turning it up a notch on Monday morning. She will be guest tweeting all morning at Wake Up, then will transport herself in ultimate style across beautiful Sydney Harbour to Studio 10. And what better way to follow her journey live on television than with a chopper. Continuing as the home of Australian music, Wake Up brings you another jam-packed week of special performances. Ready to rock the beachside studio are Aussie rock band Spiderbait, Brisbane’s singer-songwriter Kate Miller-Heidke and controversial recording artist/model Iggy Azalea. Comedian Charles Firth and celebrity PR guru Max Markson take charge of the #wakeup twitter feed and share their thoughts throughout the morning. Then on Studio 10, the ultimate “slashie” (businesswoman/model/author/singer/tv star/columnist/proud mum) Katie Price, aka Jordan, stops by to chat about how she manages to keep all the balls in the air. Later in the week, Australian television veteran and Gold Logie winner Ray Martin sets his alarm early as he graces the panel. And Friday, in a Studio 10 exclusive, the show will be broadcast live from the News Corp Pride of Australia Awards at Bennelong Lawn, in Sydney’s Royal Botanic Gardens. Wake Up airs 6.30am weekdays, followed by Studio 10 at 8.30am. Sandra Sully will be joining the panel on Friday as the host of the Pride of Australia awards.